You've heard the expression "easy as pie," but if you've ever made a pie, you know that pies are NOT easy to make. They're not even all that easy to eat. 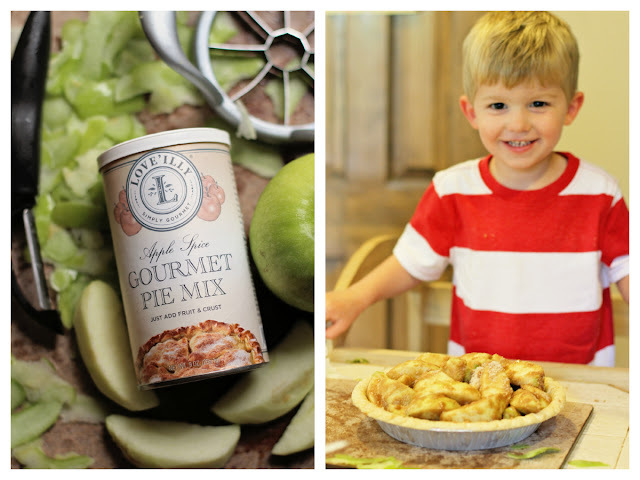 Of course pie is delicious and always worth the trouble, but pie is never something I thought I'd be making with my wild, impatient, messy three-year old. 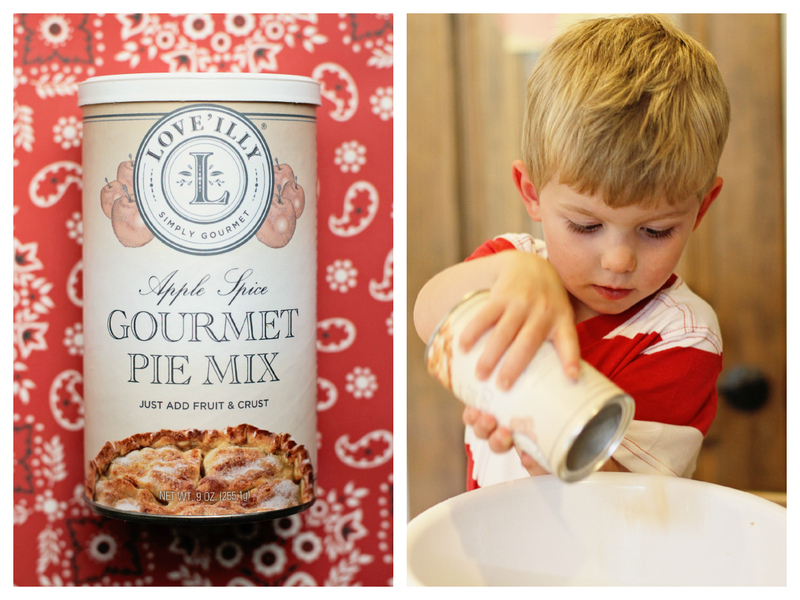 However, we received a package of Love'illy Apple Spice Gourmet Pie Mix and Mac insisted that he help me make pie IMMEDIATELY. Cue my panic attack. Turns out, pie can be really easy to make. 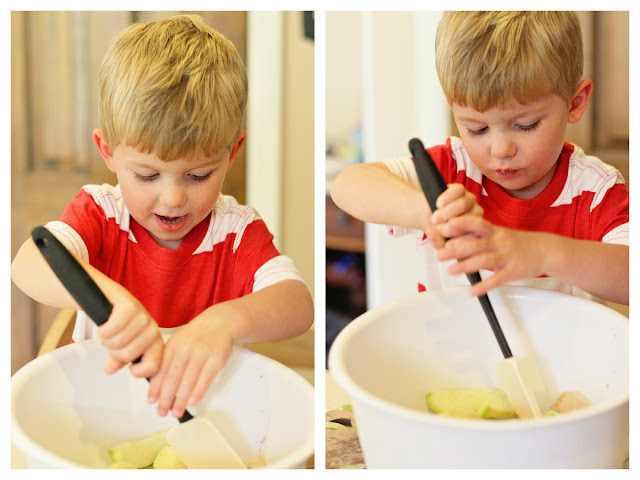 So easy even a three-year old can do it! 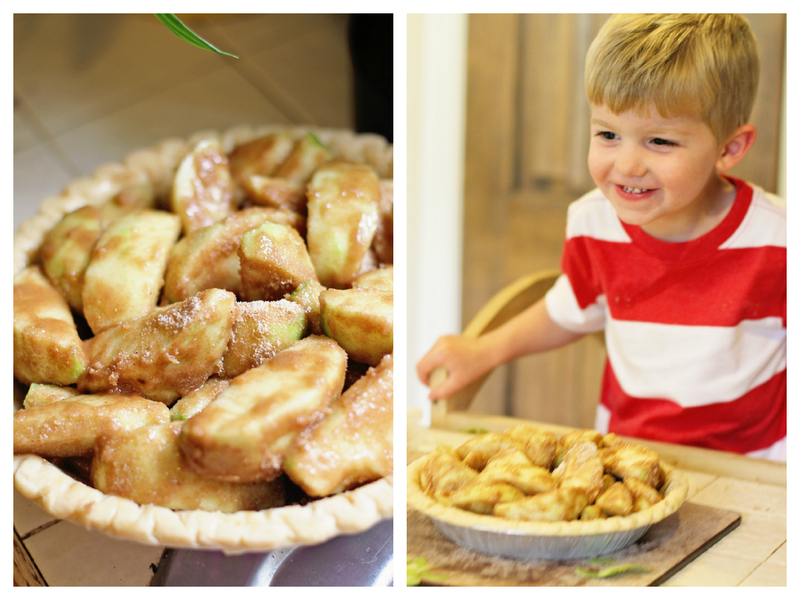 With a little help from a grown-up on the peeling and baking parts. 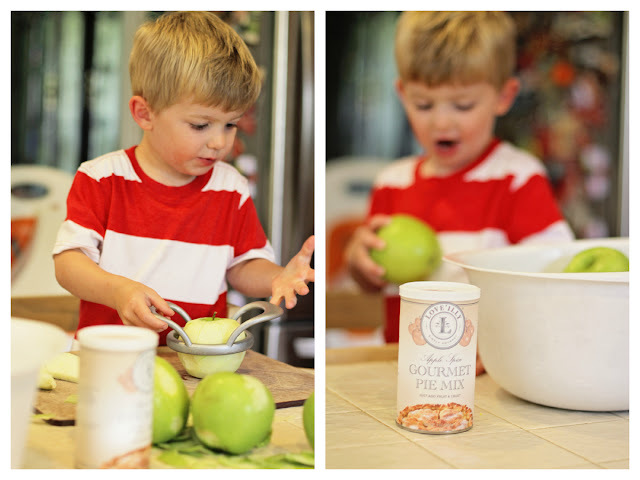 Mac really surprised me with how excited he was he help me bake a pie and how actually helpful he was. I was really impressed with how well he followed directions and how happy he was to create something for us. He insisted that we were baking the pie for his grandparents and asked me multiple times if we could sing them Happy Birthday while we ate. Yes buddy, sure thing. 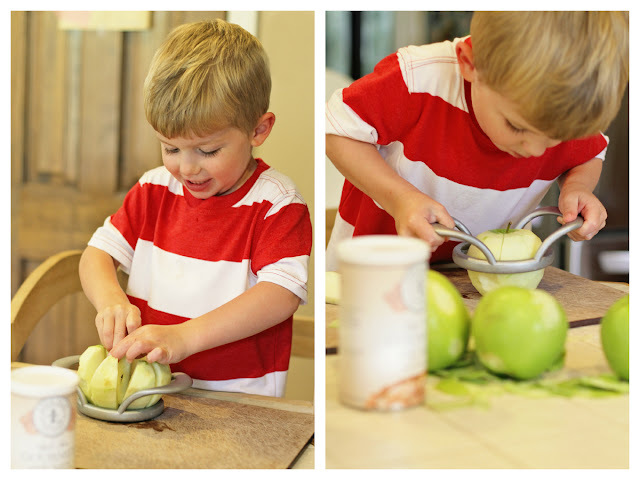 We started by prepping the apples. I washed them and Mac started sampling them. 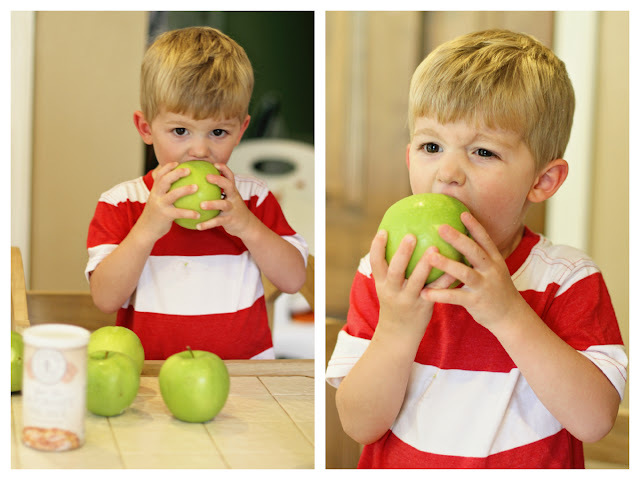 He took bites out of every single apple, just to make sure none of them were poisonous. 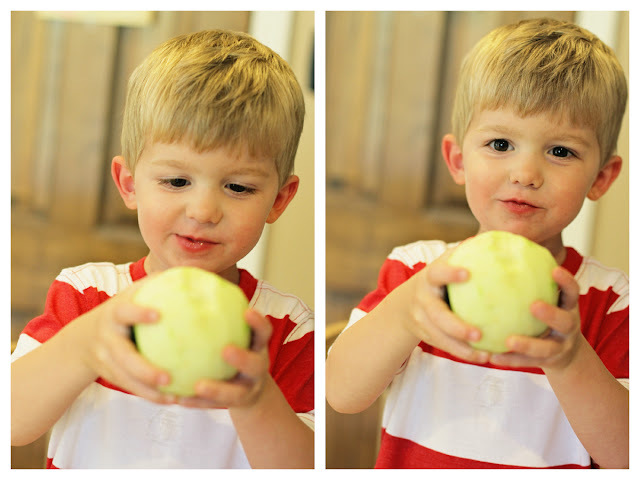 He loves apples, but he's not a fan of the peels, so that part got chewed up and spit out all over the counter and kitchen. 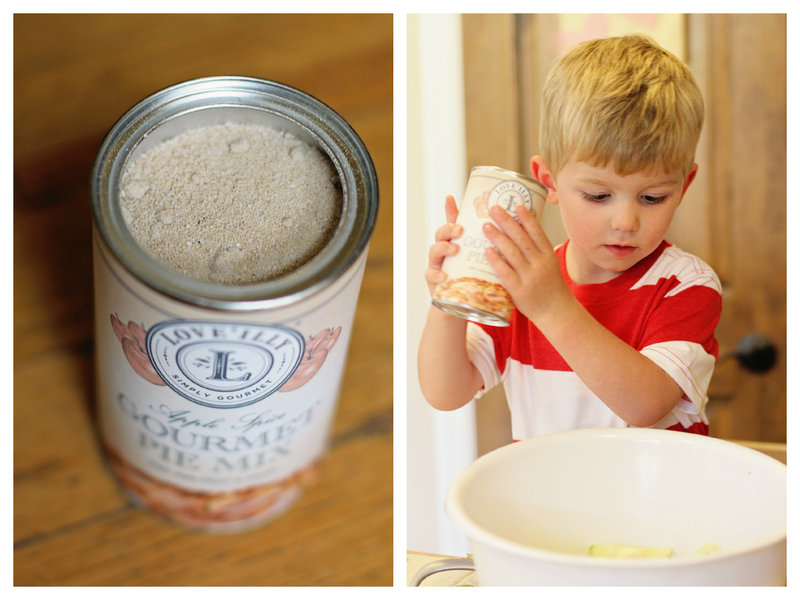 Cooking with a preschooler is not for the faint of heart. Once I got the apples peeled, sampling was much easier and we lost quite a bit of our pie ingredients to his little chompers. Thankfully I'm not very good at guestimating the weight of apples and bought way too many to begin with, so all was well. 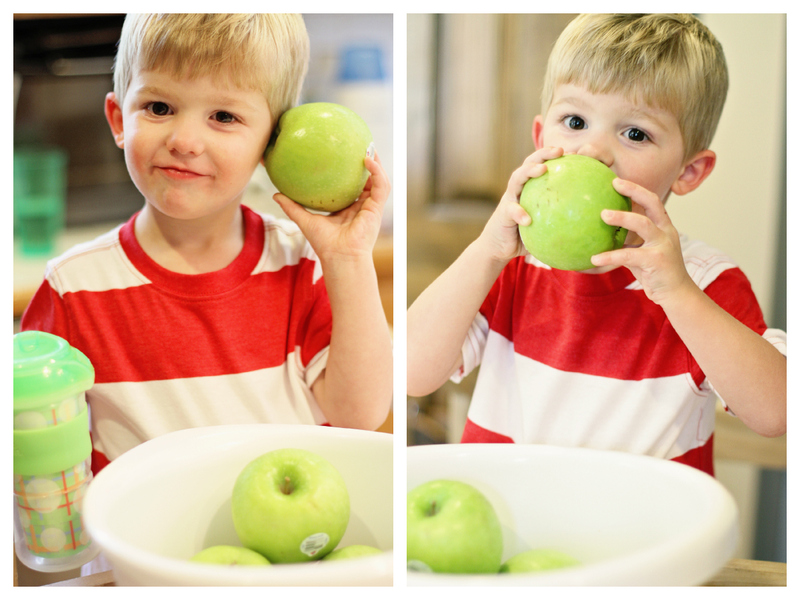 I let Mac have the job of coring all the apples, which he loved! Put that child to work! 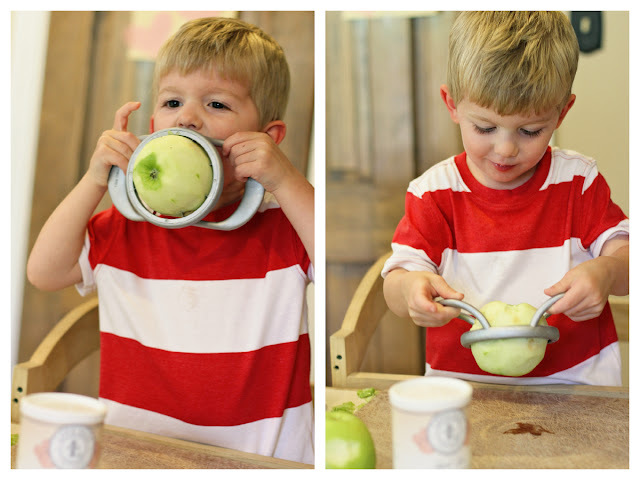 I'd get them started and then let him takeover the process of pushing the apple corer all the way down to the bottom of the apple. Sometimes this took quite a bit of effort and exertion on his part (and we had a few smashed apple bottoms), but by the 3rd apple he figured out that he could wiggle/rock it back and forth and get it through pretty quickly. 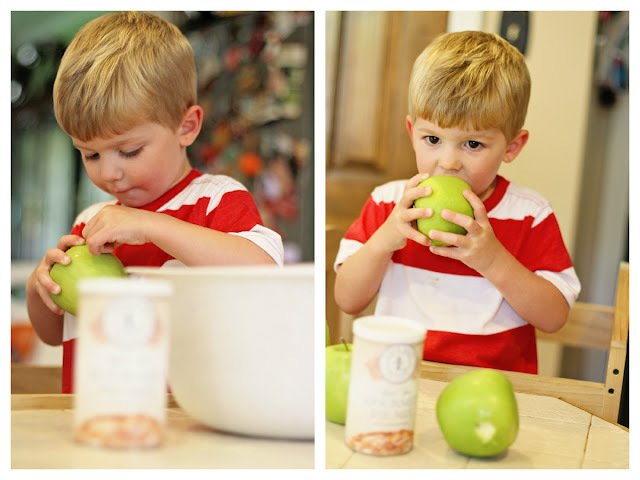 Of course this didn't stop him from eating all the apples during the process. 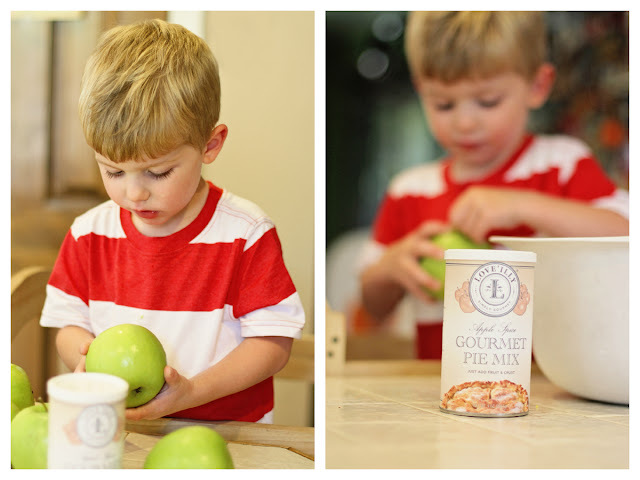 Once cored and cut into pieces, he put all the apple slices into a big bowl and added our secret ingredient....Love'illy Gourmet Pie Mix. This stuff is genius. 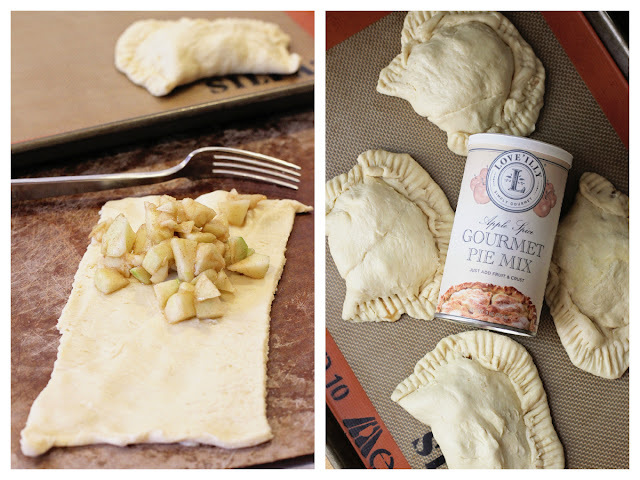 Other than the apples and the crust, this is ALL you need to add to make an amazing apple pie. No measuring, no sifting, no mess! I didn't have to worry about not having the right ingredients or getting flour and butter all over the kitchen. This was it...just pour it on the apples and stir. Literally, easy as pie. Stirring was his favorite part. He really wanted to use the electric mixer, but I put a stop to that idea. Once the apples were coated, you just dump them in a pie crust (we used a frozen one). We had to sample the apples (why stop now) and they were amazing! This spice mix was so good. I would have loved to just throw them in a baking dish, get them soft and warm and have them as dessert without the crust. Or serve them warm over vanilla ice cream! Or put them on cinnamon pita chips! Or on sugar cookies! The possibilities are endless. But the best part of the whole process was seeing how excited and proud this guy was to have just made his very own apple pie! He could hardly contain himself. 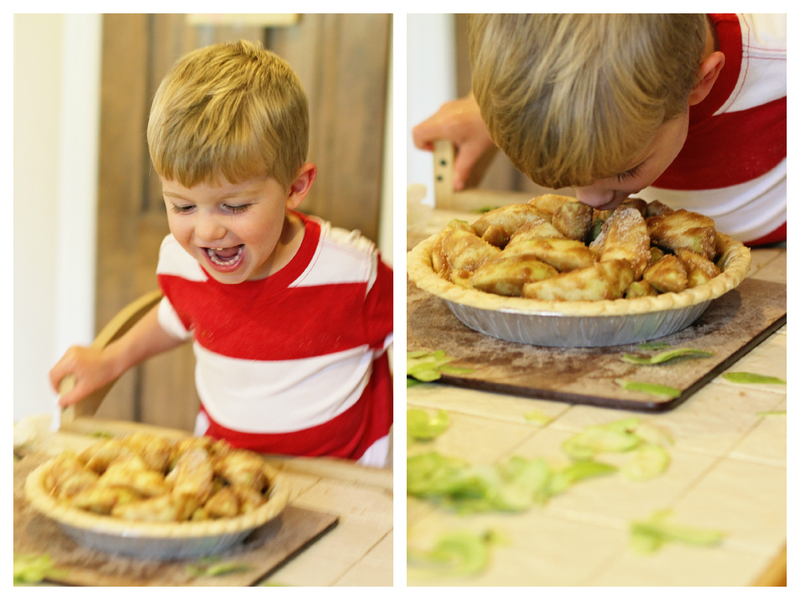 Multiple times I caught him trying to eat the pie right then and there, before we even baked it! I'm not sure the concept of needing to cook it was registering with him at the moment. Since I way overestimated how many apples we'd need (or maybe I just bought giant apples), we had some spiced apple mix left over, which I chopped up and wrapped in some crescent roll dough (apple-turnover style), so Mac and I could have a treat right away. These guys only needed to cook for a few minutes and they were OH SO GOOD. So good we ate them before I could even take a picture of them cooked. That's good. Back to our pie...I threw the second frozen crust on top of the pie for a home-made double-crust look and baked it while Mac was napping (all that apple coring took it out of him, apparently). Not only was it delicious, but it made the whole house smell amazing. 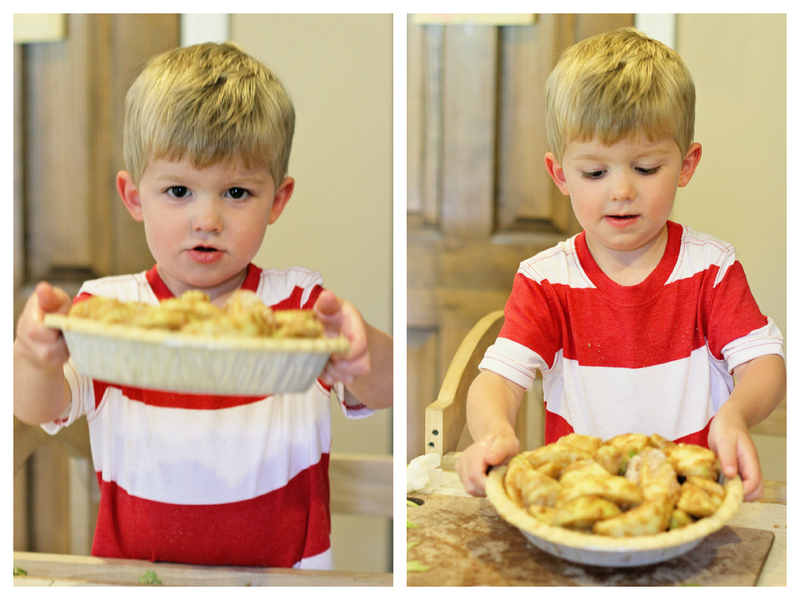 We took it over to Mac's grandparents the next day and they were SO impressed that we'd made a pie! I didn't bother to tell them just how easy it was. Wink wink. Mac also insisted we sing them Happy Birthday three times. Whatever. This mix is one of those "mom hacks" that I'm just going to take all the credit for! :) And now I know what I'll be offering to bring to the 4th of July picnic! 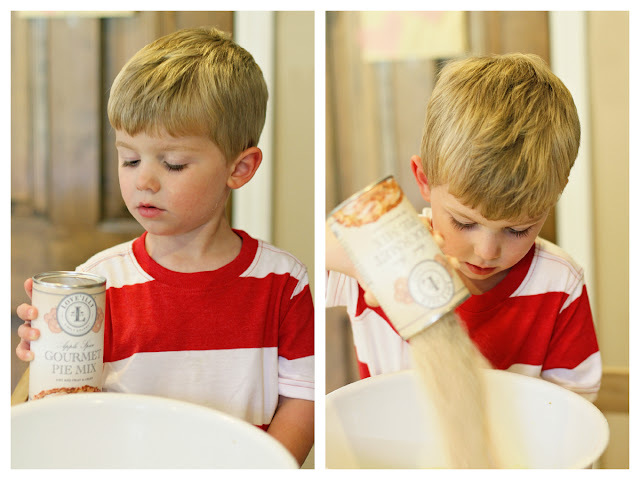 Do your kids like baking? * I received this product as part of the Savvy Sassy Moms Product Scouts program. All opinions are my own. YUM!! I love delicious and easy cooking/baking! And now I want pie... thanks a lot! Also - Mac is the cutest helper... EVER. I had no idea something like this existed! This would make baking basically fool proof. I love it! I don't think I've seen a cuter little chef! I love that Mac was so into helping!! And that pie looks delicious. We haven't ever made a pie, but we might have to give this little hack a try! Yummy! So cute!! Thank you for sharing this!!! Oh how fun! I need to try this with my toddler. She would have a blast! UMM seriously, you're KILLING me with this right now! I am wanting some apple pie SO BAD. That stuff is genius. I would never attempt to make a pie on my own, let alone with a toddler, but this makes it look doable! My word. Those turn overs... YUM. Mac is quite the little helper! Now I can't wait to go apple picking in the fall! Okay, so I'm the crazy person who never likes pie (I know, I'm weird). But.... baking the apples with the spices sounds RIGHT up my alley. I can't believe how he helped you, so adorable and so helpful! :) And I seriously love apple pie, I can't wait to go pick apples in the fall at Eckerts!